Whitefield began developing his preaching skills early. In school he developed a strong interest in plays and acted in several. Although he decried the theater in his later years, his journals demonstrated that his theater experience helped develop his vast oratorical gifts, which would later allow him to preach with ease to crowds of up to 10,000 during the Great Awakening. Through an influential friend, Whitefield’s mother was able to secure her son a work—study arrangement at Oxford. But before he left Gloucester, a friend named Gabriel Harris, the keeper of the city’s best bookshop, showed him a new book, the second edition of William Law’s A Serious Call to a Devout and Holy Life. He looked at the book only briefly that day, but he read these words before returning it to his friend: “He therefore is the devout man who lives no longer to his own will, or the way and spirit of the world, but to the sole will of God.” These words sparked a new fire and zeal in Whitefield. In 1735, the same year he became a full member of the Holy Club, Whitefield experienced spiritual “New Birth"—three years before the Wesleys’ similar experience at Aldersgate. He was ordained a deacon at Gloucester in June 1736 and preached his first sermon a week later. With his booming voice and boundless passion, Whitefield soon looked for ways to expand his ministry beyond the walls of the Church of England. He began preaching outdoors. Though he was not the first to attempt this, Whitefield’s stirring and skilled delivery made it famous. Wesley’s experience in America had been so discouraging that Whitefield indicated a desire to preach there, Wesley advised him not to make the trip. Whitefield politely ignored this advice and sailed to Georgia in 1739. Whitefield’s preaching spread the message of Christ life wildfire on dry ground in the Colonies, and even Benjamin Franklin (who once studied Whitefield’s strong voice as he preached) was counted among Whitefield’s frequent hearers. Whitefield briefly split from the Wesleys over doctrine. Whitefield was a staunch, if not terribly scholarly, Calvinist, and he perceived the Wesleys’ emphasis on free will as an echo of heretical Pelagianism. The Wesleys accused Whitefield of a adopting a theology that excluded too many potential converts. Through the mediation of a friend, Whitefield and the Wesleys were eventually reconciled, though their theology never completely meshed. Charles W. Christian is pastor of Canby Chapel Church of the Nazarene (Canby, Oregon) and an adjunct professor of religion at George Fox University. Maxfield came to faith in 1739 under the ministry of John Wesley and George Whitefield. Soon Wesley made Maxfield the lay-leader in London at the Foundry, a cannon factory turned meeting house. His duties included explaining Scripture and praying—but not preaching. Then in 1741, without sanction from Wesley or any other church official, Maxfield began preaching. Wesley considered this a serious affront to ordained clergy and determined to examine the matter. Mollified, Wesley attended a Maxfield sermon. Maxfield was an eloquent expositor, and Wesley was convinced of his gift. Fellow preacher Henry Moore recounted that Wesley “bowed before the force of truth, and could only say, ‘It is the Lord: let him do what seemeth him good.’ “ Once this door was opened, many other lay preachers would follow. Tension between Wesley and Maxfield, however, did not cease. 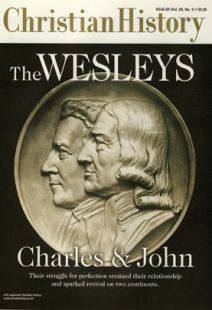 In 1763, Maxfield joined an enthusiast sect and claimed that he had reached perfection—an extreme form of Wesley’s doctrine. Seeing his teaching misapplied, Wesley tried to confront him, but Maxfield refused to listen. Robert Schultz is a freelance writer living in Glen Ellyn, Illinois. In 1772, two years after being ordained in the Anglican priesthood, Coke had a conversion experience under the ministry of Methodist dissident Thomas Maxfield. Coke returned to his parish in South Petherton preaching this newfound gospel to an unappreciative congregation. Within a year, Coke’s irate parishioners dismissed him. He immediately joined the Methodists and became one of John Wesley’s most trusted—if troublesome—assistants. Coke was a risk-taker and found Wesley too hesitant. For Coke, lost souls couldn’t wait. Wesley thought Coke was impulsive and absent-minded. He and others feared that Coke’s reckless passion would destroy the Methodist movement. They also feared his ambition and wondered if he was vying to be Wesley’s successor. Coke tended to assume more authority than he was given. The sharpest disagreement arose when Coke began to refer to Wesley, himself, and American Methodist leader Francis Asbury as bishops instead of superintendents. Coke’s bishops functioned like superintendents, but the title connoted more authority than Wesley intended. English Methodists were stunned. Wesley was livid. “Men may call me a knave or a fool, a rascal, a scoundrel, and I am content,” he said, “but they shall never by my consent call me Bishop!” Coke and Asbury’s founding “Cokesbury College” (naming it after themselves) did not help matters. After success in America, Coke set his gaze to more exotic lands. But Coke’s proposal to send missionaries to Africa and India received a lukewarm reception from English Methodists. Wesley agreed only in principle. Coke’s zeal, however, continued unabated. He even sought support from Baptist churches. After years of Coke’s pleading and financial sacrifice, the Methodist societies finally supported an outreach to Africa. Yet Coke longed for India. In tears, an aging Coke finally persuaded the Methodists to allow a mission to India. Fulfilling the call, he accompanied the expedition but died en route. His body was found kneeling in prayer in his cabin. Unlike his friend John Wesley, John Fletcher never took to the road as an itinerant evangelist. Instead, as a parish vicar, he accomplished more for Methodist theology than Wesley had. Wealthy in his youth, Fletcher chose the meager income of a vicar in a poor manufacturing town. There he preached for 28 years, pursuing the townspeople, according to Wesley, “to every corner of his parish by all sorts of means, public and private, early and late.” This persistence was not always appreciated. Once Fletcher escaped death by the hands of a mob only because his parishioners suddenly called him to preach at a funeral. Wesley had hoped Fletcher would be his successor, but he outlived the younger man by six years. Steven Gertz is an editorial assistant at Christianity Today International.